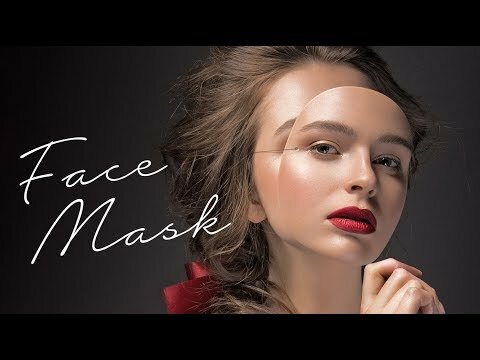 Photoshop: How to Create a Face Mask Photo Portrait. Hi. This is Marty from Blue Lightning TV. I'm going to show you a quick and easy way to create a face mask of a person. haven't subscribed to my channel, yet click the Subscribe button at the lower, right..
an angle and if possible, the person's hand should be placed an inch or two below the chin. I'm not allowed to distribute it. Once you have your photo, make a copy of it by pressing Ctrl or Cmd + J. Next, we'll create a selection that will define the shape of the face mask. so to save time, I won't be going over them here. I find that the most accurate way to create the shape is to use your Pen Tool. like to watch it, click the link at the upper right corner or in my video's description below. and drag over the face. and proceed to draw paths making sure that it follows the edge of your subject's chin. Right-click directly on the path to open the fly-out list and click "Make Selection". Make sure the Feather Radius is 0 and click OK.
Alt-click or Option-click the Layer Mask icon to make an inverted layer mask of the selection next to the active layer. Just a quick note: if you ever want to invert a layer mask, just press Ctrl or Cmd + I. We'll angle and reposition the face mask by pressing Ctrl or Cmd + T to open your Transform Tool. Before we transform it, go to View and make sure "Snap" is not checked. If it is, just click it to de-activate it. This will prevent the face mask from snapping to a particular position when we move it. to an angle you like. To reposition face mask, just drag it. Then, press Enter or Return. Next, we'll add a subtle bevel to the mask to give it a bit of dimension. Double-click the angled face layer to open its Layer Style window. The Style is Inner Bevel, the Technique is Smooth and the Depth is 100%. The Direction is Up, the Size is 7 pixels and the Soften is 0. The Angle is 124 degrees and the Altitude is 32 degrees. The Highlight is white, its Mode is Linear Dodge and its opacity is 10%. The Shadow's Blend mode and color are irrelevant, since its opacity is 0%. Just click the small arrow. Click the New Layer icon to make a new layer. We'll place this layer into a folder, since we'll be adding a few more string elements. Press Ctrl or Cmd + G. Name the folder "String". Make the layer active and open your Pencil Tool and Pencil Picker. Make the Size: 2 pixels, the Hardness: 100% and the Opacity: 100%. Press "B" to open back your Pencil Tool and place your cursor to a location above the ear. Then, click your mouse or pen and release. Place your cursor where the string would be attached to the mask and click. This connects the start and end point with a line. Double-click the String layer to open its Layer Style window and click "Bevel & Emboss". The Style is "Inner Bevel", the Technique is Smooth and the Depth is 1000%. The Direction is Up, the Size is 2 pixels and the Soften is 0. The Angle is 55 degrees and the Altitude is 25 degrees. The Highlight Mode is "Linear Dodge"and its Opacity is 70%. The Shadow Mode is 0. Go to Filter, Blur and Gaussian Blur. Blur it point 5 pixels. Reduce its opacity to 50%. In this particular example, I want the string to appear to be behind this area of the subject's hair. or use a better method, which is to use a layer mask. This method is non-destructive to the string. and open my Brush Tool and Brush Picker. I'll adjust the size in a moment. The Hardness is 0% and the Opacity and Flow are both 100%. the right or left bracket key on your keyboard to make the brush bigger or smaller. I'll brush over the area of the hair to hide the string. Next, we'll create the string's shadow. Reduce the brush size to 2 pixels. Click just below the string on the mask, release and Shift-click just below where the string ends. and reduce its Opacity to 40%. Make a copy of the shadow by pressing Ctrl or Cmd + J and temporarily hide it. Make the original shadow layer active. We're going to bend the shadow to the curvature of our subject's face. and I'll make sure the middle of the shadow is positioned just below the string. When you've finished warping YOUR shadow, press Enter or Return. mask to hide it, as well as areas of the hair where the string is masked out. and click the Layer mask icon to make a layer mask next to it. Brush over the shadow next to the face mask to hide the warped shadow over that area. Lastly, we'll create the hole for the string on the face mask. and Ctrl-clicking or Cmd-clicking the New Layer icon. Open your Elliptical Marquee Tool and place your cursor at the end of the string. We'll give it some dimension, but to do this, we need to fill it with a color. The particular color is irrelevant, since we'll be reducing the Fill to 0. You'll see how in a moment. I'll fill it with my foreground color, which is black by pressing Alt or Option + Delete. Deselect it by pressing Ctrl or Cmd + D. Reduce the Fill to 0%. that we add to it. Double-click the thumbnail of the hole layer to open its Layer Style window. The Style is "Inner Bevel", the Technique is Chisel Hard and the Depth is 200%. The Direction is Down and the Size is 1 pixel. The Angle is 140 degrees and the Altitude is 30 degrees. The Highlight Mode is Linear Dodge and the Opacity is 50%. The Shadow Mode is Multiply and its opacity is 60%. You can reposition it by pressing "v" to open your Move Tool and dragging it. Next, we'll be able to see through the hole. Ctrl-click or Cmd-click the thumbnail of the Hole to make a selection if its shape. Go to Select and Transform Selection. At the top, click the chain-link icon to link the Width and the Height. In either field, type in 70%. Scroll to the bottom of the Layers panel and make the layer mask active. Fill the selection with black to reveal the face under it and deselect it. To see your entire image, press Ctrl or Cmd + 0. This is Marty from Blue Lightning TV. Photoshop: How to Create a Classic, Film Noir Portrait - Plus GIVEAWAY!!! Photoshop Tutorial: How to Make a Basket-Weave Effect from a Photo Photoshop Tutorial: How to Create a Dispersion, Splatter Effect! Photoshop CS6 Tutorial: How to Make an Editable TEXT Portrait from a Photo. Photoshop Tutorial: How to Transform a Photo into a Spray-painted, Stenciled Portrait! Photoshop: How to Add Beautiful Sun Rays or Sunbeams to Photos Photoshop Tutorial: How to Transform Yourself into a Marble, Sculpture Bust! Photoshop: Create & Personalize Obama's HOPE Poster Design Photoshop Tutorial: How to Transform a Photo into a Stained Glass Window! Photoshop Tutorial: How to Make a Planet EXPLODE from its Core.